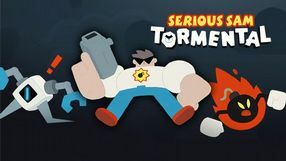 A shooter game with roguelike elements, Tormental is a spin-off to Serious Sam. The players traverse locations generated within the mind of a demigod of destruction - Mental, in an attempt to survive the confrontation with prevailing enemy forces. Another major installment in the series of brutal and bloody shooters developed by the Croatian Croteam studio. The story of this part is set before the events of the third installment, in which Sam had to face the forces of the main antagonist - Mental in a futuristic, virtual version of ancient Egypt. Mental's goal was, obviously, to take over the Earth. However, the story in this new installment seems to be a bit more mature. In terms of gameplay, Serious Sam 4 remains faithful to the core mechanics of the series - the player once again eliminates entire hordes of enemies using a wide array of diversified weapons. What has changed however, is the approach to the players, who are now given significantly more freedom and huge open maps where even more dark creatures await them. When it comes to technology, the game is powered by Serious Engine 4, the improved version of the original, accompanied by motion capture and photogrammetry technologies. 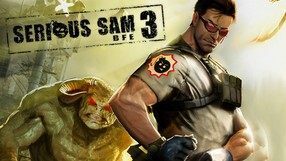 A special version of Serious Sam 3: BFE, developed for virtual reality goggles and dedicated motion controllers. The players once again assume the role of the titular hero and face hordes of smaller and larger monsters. The main objective of the game is to stop the evil Mental from taking over the world. A side installment of the series of dynamic and very brutal FPP shooters developed by CroTeam. This installment was created exclusively for virtual reality sets. Serious Sam VR: The Last Hope shows the beginnings of the great war with the forces of series’ main antagonist Mental, who wants to break the resistance of nations by destroying ancient temples and other places of cult. During the game, players assume the role of Sam Stone who uses a star cruiser to travel between the planets attacked by the enemy and who then faces hordes of monsters. Gameplay mechanics of the title are similar as in full-fledged installments of the series. The game focuses on dynamic action and brutal elimination of enemies. Monsters from previous installments and some new ones appear in the title and each level ends with a challenging boss fight. Between the missions one can upgrade armor and equip the protagonist with various power-ups. 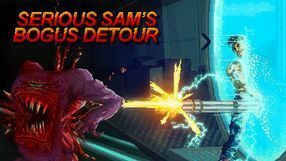 Serious Sam's Bogus Detour is a spin-off of the Serious Sam series developed by Crackshell in cooperation with Croteam. Once again we play as the fearless Sam who has to face hordes of enemies. Gameplay is based on the series' classic scheme. We fight with numerous enemies and use against them guns like pistols, machine rifles, swivel guns, and flamethrowers. The more monsters we slay, the more experience points we get to level up and progress our hero. Unlike in the 'big' Serious Sam games, action in Bogus Detour is presented from a top-down perspective. The game offers a campaign that can be played alone or with up to three more players. Additionally, Bogus Detour offers a twelve player Survival Mode, Deathmatch and Team Deathmatch. The game features simple, old school visuals. A special version of Serious Sam: The Second Encounter, designed for virtual reality sets. In addition to the single player campaign, the Croteam studio has a number of multiplayer modes based on competition or cooperation. 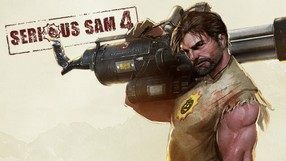 A new edition of Serious Sam: The First Encounter developed by Croteam for VR device users. The players assume the role of the titular character, who is transported to ancient Egypt using a special time machine. His mission is to change the course of history, and eliminate Tah-Uma – the last of the immortals who travel across the galaxy and destroy encountered civilizations. Serious Sam VR: The First Encounter is built from fifteen extensive missions, pitting the player against enemy hordes, and allowing him to search for secrets. Our adversaries include cannon fodder, as well as more advanced opponents, including bosses. Fortunately, our hero is not unarmed, and makes use of ten varied weapons, including a classic Colt revolver, a shotgun, a chainsaw, or a portable cannon. Before the game begins, we can choose whether we want to move around the levels fluently, or employ a special teleportation system. Additionally, we can use dedicated motion controllers for aiming. Aside from the story campaign, the game offers various multiplayer modes, based on cooperation, as well as on competition. Serious Sam: The Random Encounter is a jRPG game created by Vlambeer studio. The plot was set in the universe of the Serious Sam series. The player directs the actions of the title character and his two faithful companions, who have to face hordes of monsters. The production is maintained in the style of games from the era of 8- and 16-bit computers. An independent game set in the world of Serious Sam. As we travel through various locations, we encounter a number of absurd enemies on our way and eliminate them using various types of weapons combined with each other. Serious Sam HD: The Second Encounter is the second installment of the first person's perspective shootout, which was refreshed by Croteam studio. This time the title character, who travels in time and space, has to face monsters from South America, Babylon and medieval Europe. The game is based on the extermination of hundreds of monsters. Compared to the original version released in 2002, the remastered version has a much better graphic design, thanks to the use of the Sam Engine 3 engine. Serious Sam HD: The First Encounter is a remastered version of the popular FPP shooter, prepared by Croteam development studio. Players take on the role of Sam "Seriousa" Stone, a special forces soldier who is sent into the past to prevent the evil that could destroy humanity. The creators decided to remain in line with the plot and basic gameplay mechanisms of the original game published in 2001, however, changing the visual setting of the game and adapting it to more modern standards. A set of two games included in the Collection of Classics of Cenega Poland. Buyers of this product actually receive two games: Serious Sam: First Strip and Serious Sam: Second Strip. Official continuation of the famous 2001 and 2002 shooters, in which the action was observed from the perspective of the first person. In many ways this title resembles such productions as Will Rock, Quake II or Halo. Serious Sam: Next Encounter in a straight line continues one of the most colorful, de-pinked, yet incredibly playable positions. The publisher of this item is Global Star Software. Serious Sam Advance is another attempt to jump over the "FPP on GameBoy Advance". The game's producer is Climax, a company responsible for GBA positions such as ATV Quad Power Racing and Disney's Lilo & Stitch 2. Console version of one of the most crazy PeCet shooters. We play the title character Sam and set off to fight against a mighty being known as Tah-Um. The game also has an extensive multiplayer. Sequel action/FPS game Serious Sam: The First Encounter. Players take on the role of the muscular commander "Sam Stone" and follow the story which is a close continuation of the plot of the previous part. Serious Sam: The First Encounter is a crazy first person view shooter produced by Croteam's Croatian studio. The main hero of the game is a soldier of special units, who thanks to the technology called Timelock has a chance to move into the times of ancient Egypt and kill evil, which in the future may destroy all mankind.